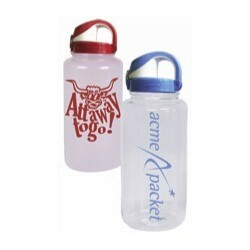 Nalgene On-The-Fly – OTF – Custom Water Bottles with your graphic or logo printed. The On-the-fly is a great leak-proof bottle. With the Nalgene OTF’s convenient, one-handed cap design, means you don’t have to drop everything to take a sip. Its slim shape and leak-proof cap make it ideal for workbags, gym bags, and backpacks alike – without worry that it’s going to give your stuff a soak. All our Nalgene bottles are BPA free. The lid is designed to lock so you can put the bottle in your pack or bag with confidence that things will stay dry. The hassle-free loop top and hinge is designed so the lid stays in place but also configured so you won’t bump your nose when you take a drink. 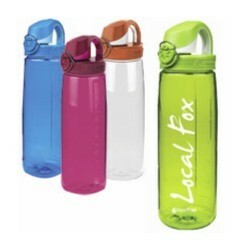 The Nalgene OTF is one of our favorite and most popular bottles. Get a quick quote or buy now. Our simple pricing means you get: Free shipping in the 48 continuous United States. Free graphics setup, Free One-Color imprint and free-vector art setup & conversion.